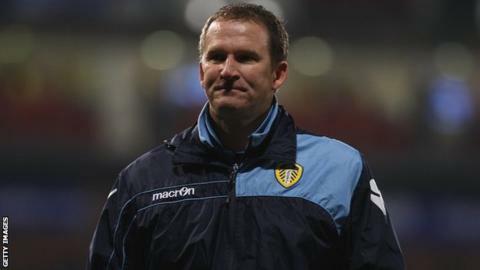 Former Blackpool and Leeds United boss Simon Grayson has taken over as the new manager of League One promotion contenders Huddersfield Town. The former Aston Villa and Leicester City defender, 42, has signed a three-and-a-half-year deal. Huddersfield dismissed manager Lee Clark last week, despite lying fourth in the division. Prior to defeat by leaders Charlton in November, Clark presided over a club-record run of 43 league games unbeaten. Grayson told BBC Radio Leeds: "It's not so often you come back into football so quickly after losing your job and certainly not into a club with such a good chance of promotion. "The chairman really sold the club to me. There's some exciting players here with a lot of experience. "I know what I need to do here, I want to get promotion. I've got promoted out of this league twice before and I want to do it again." Yorkshireman Grayson, whose younger brother Paul is the county coach at Essex CCC, began his managerial career at Blackpool, then in League One. He guided the Seasiders to promotion before taking over in charge of boyhood heroes Leeds in December 2008 following the sacking of Gary McAllister. He steered Leeds to promotion from League One to the Championship in his first full season at the club, before finishing seventh in the Championship the following year. But he was dismissed following the 4-1 defeat at home to promotion rivals Birmingham City on 31 January. And Leeds appointed Neil Warnock, who had been linked with a return to one of his old clubs Huddersfield, on Saturday. Huddersfield will expect Ripon-born Grayson to have an immediate impact at the Galpharm Stadium. Following defeat in last season's League One play-off final by Peterborough United, Terriers chairman Dean Hoyle made it clear that Clark had to steer the club to automatic promotion this season. The club's recently released accounts showed a 29% increase in football costs up until 31 May last year, Clark having spent £7.29m on building his squad. As a result, the club lost £4.1m, the second consecutive year they have lost over £4m, although the £2.5m income from the sales of Anthony Pilkington to Norwich and Lee Peltier to Leicester are not included in the most recent figures. Hoyle insists that he remains committed to providing funding this season, but says that the losses were not sustainable.